Clear skies and moderate temperatures didn’t mean that runners’ shoes were going to stay dry at the Sooke River 10K in British Columbia. Looking to do a race in 2017? See our picks for an event for each of the 52 weeks including trail, road and ultra races. Three Chicago-based runners have created a new running app, FlashFrame, that offers an inexpensive way to buy, sell quality race photos. Strava is offering a free pair of New Balance shoes for runners who complete the second half of their marathon faster than the first. 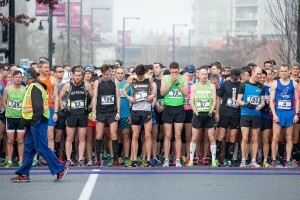 The Philly 0.0 has all the makings of a road race including a start/finish line, race numbers and a results page with only one catch: there’s zero running. Do you have the best support team? Foam rolling: what's the verdict? Foam rolling: what’s the verdict?